MOSCOW, Idaho – If the Idaho Vandals rise up and take control of a football game next fall, the foundation for such upheaval may have been laid in a play in Friday’s scrimmage. Vandals quarterback Colton Richardson had zipped a flat pass over the middle. Cutrell Haywood, with safety Tyrese Dedmon on his hip, stabbed an arm at the air, snared Richardson’s pass in stride with one hand and continued to the end zone. “Guys end up seeing that, they get fired up. It’s contagious,” receivers coach Tony Spencer said. It can take a whole team to a new level, head coach Paul Petrino said. Haywood said the play, “Poco,” called for him to read the safety and break for the corner or the post. As he described this after the scrimmage, Haywood swung his helmet in one hand and with the other absently fiddled with a thin braid, about 8 inches long, that had recently been attached to his head. “Tyrese got my hair,” Haywood said. Haywood and Jeff Cotton ran down practically everything Richardson, Mason Petrino and Nikhil Nayar threw at them. Haywood gave teammates another spark by lowering a shoulder and running over a cornerback after making a reception. 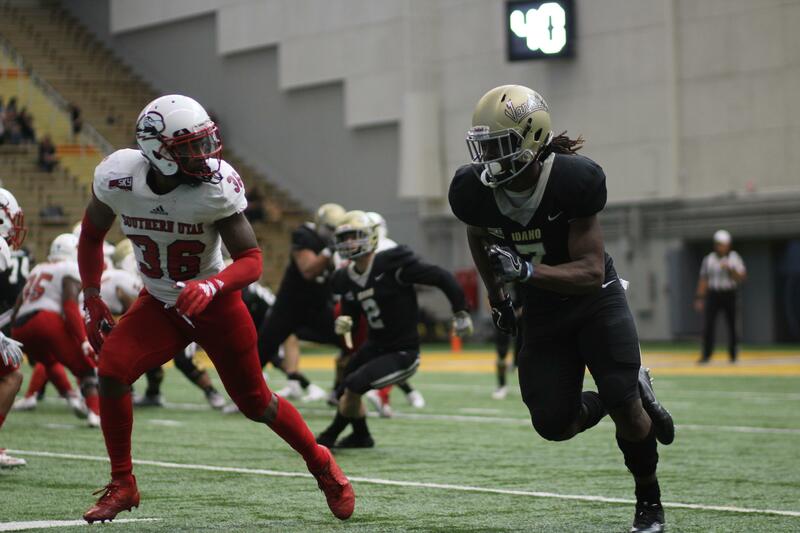 A redshirt sophomore who started seven games last year and was Idaho’s second-leading receiver with 51 receptions and six touchdowns, Haywood said he is coming into this spring with increased confidence grounded in experience. Paul Petrino said while Haywood and Cotton – who caught 49 passes for 656 yards and a team-leading seven touchdowns last season – were the scrimmage standouts, an offensive line that protected well, tight end Connor Whitney and quarterbacks on target also caught his eye. Having a pair of experienced wide receivers like Haywood and Cotton is a great lesson for Idaho’s entire receiver corps, Spencer said. But spring practice is taking a toll on the Vandals’ receivers. The group is getting so thin, though, that Mason Petrino and Richardson each stepped in for a rep as a wideout in the scrimmage. That probably makes Richardson, listed on the roster at 6-foot-4, 277 pounds, the largest wide receiver in college. Published: April 5, 2019, 8:43 p.m.